The function sets the value of the corresponding indicator property. Indicator property must be of the int or color type. There are two variants of the function. [in] Identifier of the indicator property. The value can be one of the values of the ENUM_CUSTOMIND_PROPERTY_INTEGER enumeration. IndicatorSetInteger(INDICATOR_LEVELWIDTH, 0, 5) - index 0 is used to set thickness of the first level. 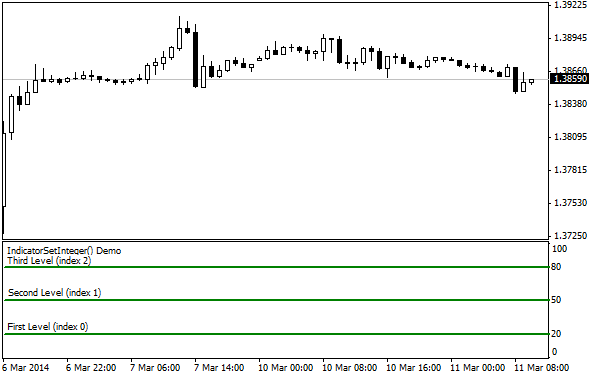 Example: indicator that turns upside down the values ​​of levels on which the horizontal lines are placed.